Its cold outside! Here on the bottom of the world, in late July, its actually winter, believe it or not. I still have a hard time wrapping my brain around it, even if I have totally acclimatized and now feel "cold" at 55 degrees fahrenheit. 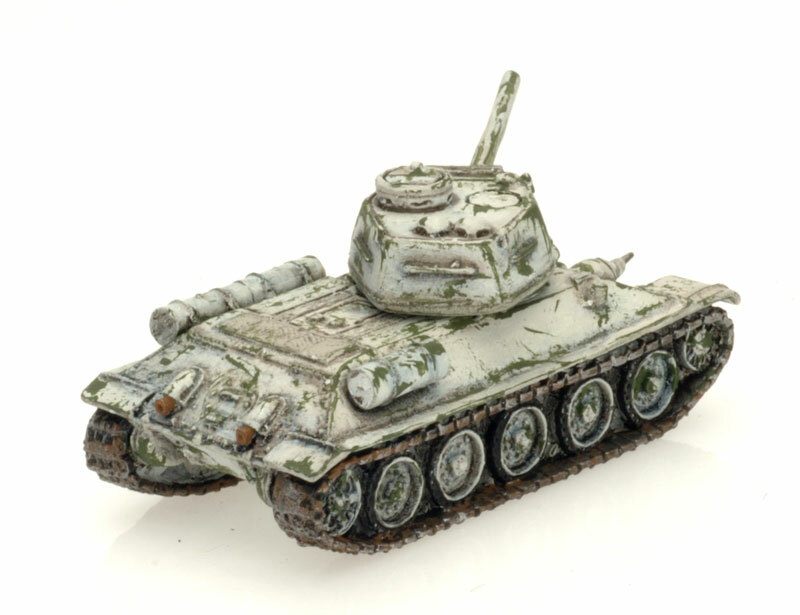 Well, this cold snap has inspired me to think WINTER for Flames of War, and as I was trawling through my boxes for a pre-assembled project to work on, I stumbled upon five T-34/85s. Years ago I painted one in whitewash, which was my second attempt at such a scheme. My original whitewash (left) and the redux (right). I didn't like it, but at least I tried something new compared to my original attempt, which I really didn't like. Anyway it went into the box, until now. Since then I have done up a Mid-war Panzerkompanie as well as a Late-war Schwere Panzerkompanie, using two types of whitewash techniques. I wanted to try both a start-of-the-winter scheme and an end-of-the-winter scheme. So my MW Panzers, old and crusty grey, got the first treatment. I started by spraypainting the whole thing white and going 'backwards', if you will, adding colors on top of that. This is easy to achieve with a solid-colored tank. 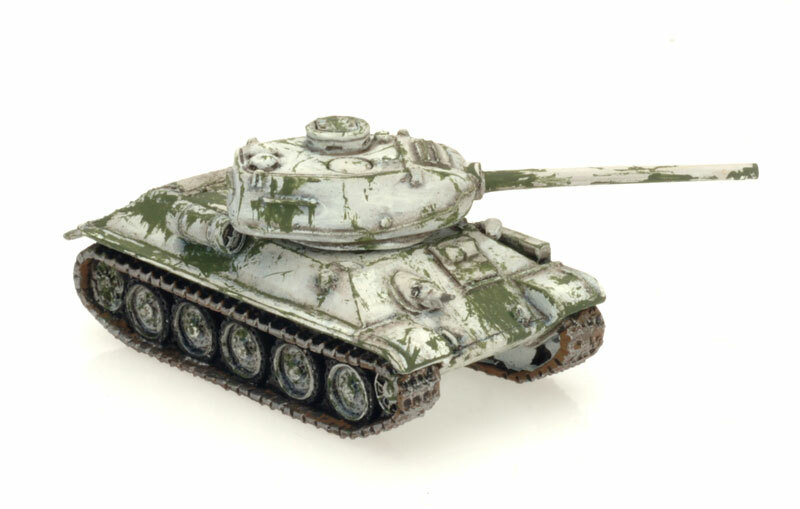 My original test T-34/85 model. The Late-war one worked from a camo scheme and added the white on top as is perhaps a more traditional method. Both used the same technique, and I'll share that process here. 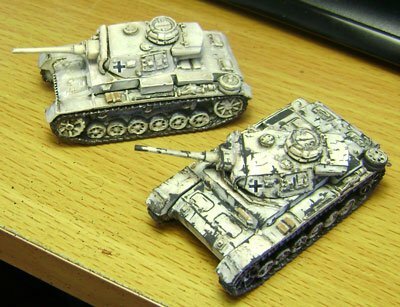 Without having any specific project in mind, I chose the T-34s because they had been started down the path of whitewashing a while back and I thought I'd finish it. If I liked it, I might then consider expanding to a whole force. I already have a lot of Soviets, so this would be a special one-off army, so I'll likely practice a bunch using my normal army to get an idea of what I want in my Soviet winter-wash army. Like the MW Panzers, I went with a early-to-mid whitewash life cycle. 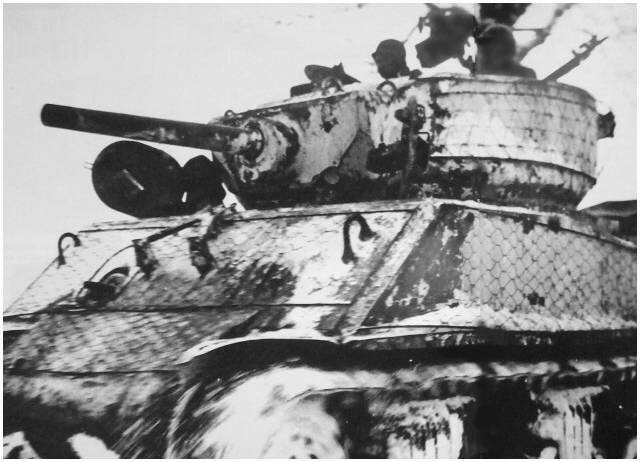 As you can see, whitewash vehicles started pretty well covered and as time went on, the white was worn off on the parts of the tank that had a lot of contact with other objects. At this point you need to decide what the tank will look like underneath and at what point of decay you want the whitewash. If you want a fresh looking application over a solid color, start by spray painting the tank white and go from there. Paint up the tracks, machine-guns, stowage, decals, etc. as normal. 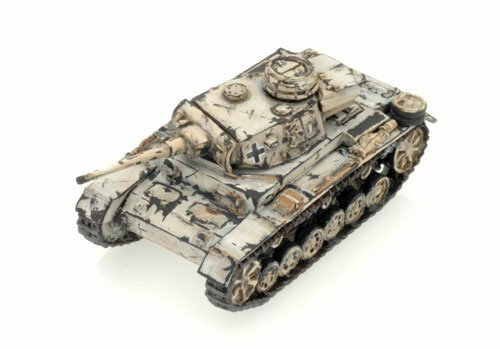 However, if you want a faded whitewash, paint up the tank as normal with all of its colors, including details, highlights, and decals. If you spray painted the tank white, give it a black wash using a very thinned mixture. This will bring out the details. Don't work about being messy at this point because once its all dry you are going to then dry brush the main surfaces with white paint to even out any hard ink edges and to soften areas that got too much ink. Try to limit your wash to the details, but don't panic if you get a little messy like on the turret above. The same turret as above, but cleaned up with a little dry-brushing to even things out and cover up ink pools and spots. Clean up the model with some dry-brushing and then finish the details, such as the tracks, exhausts, stowage, etc. If you are going for a more fresh look, the next step once you have the basics all done and the details painted, its time to take the plunge and start wearing your whitewash down a little. Grab a long-bristled old detail brush and mix up the color of paint you have chosen for your tank. 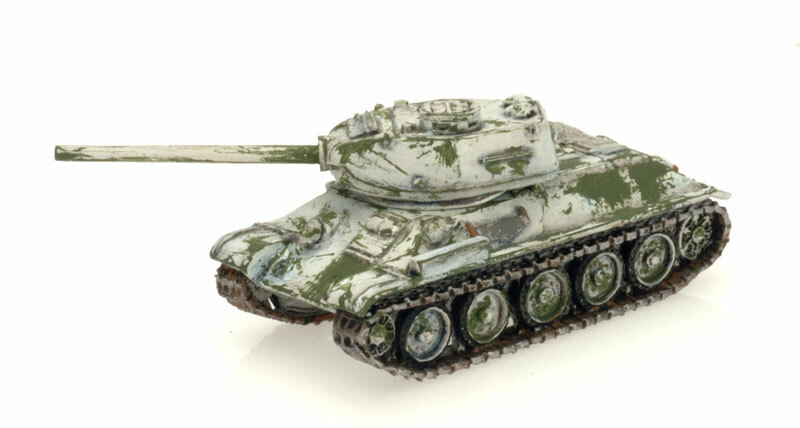 In this case I chose Reflective Green for my Soviet tank. I like it for its brightness and I think it contrasts well with the white. 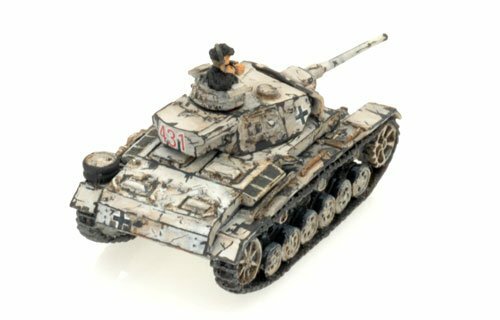 Panzer grey is great for this as well for early and mid war German tanks. I would imagine that the Western Allies' greens would look good too. Now, there are two phases to do here. The first is easy, but time consuming. Apply paint to brush, remove any excess and then pull the bristles along all of the edges of the tank and let the darker paint make a thin line along the edge. Hit all of the major angles, not forgetting going around tank hatches, tow hooks, mantlets, etc. If it has a line, highlight it. Then its time to do the surfaces. Apply paint to the same brush, remove any excess, and press the long bristles against the tank at nearly a parallel angle to the surface. Pull the brush straight down and let the bristles sort of drybrush the dark paint onto the details. Do this all over. You can then expand a bit. Remove the majority of the paint from your brush and paint 'backwards'. That is to say apply the brush to the model and push up and away from you, essentially the reverse of normal paining strokes. This causes the bristles to fan out in random directions and makes "scratches" in the whitewash. You can also make some controlled stretches too, especially in areas that would frequently get damaged or rubbed, like around hatches and the recoil length of the barrel. Think about how the crew or tank escorts mount and dismount a tank and heavily apply your "green" color there. Similarly don't damage the whitewash where the crew or other items wouldn't touch the tank, like crevasses or acute angles. 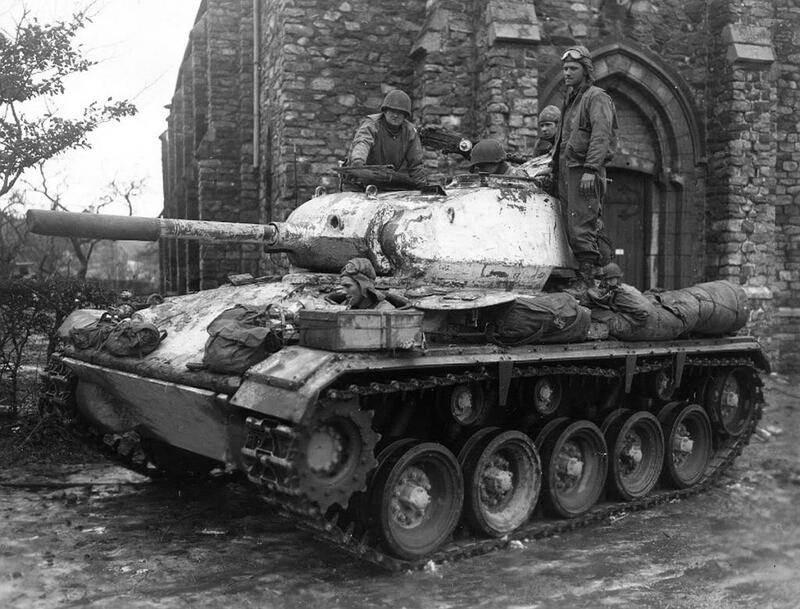 This M36 is a good example of areas of wear and undamaged areas. The extent to which you go is entirely up to you. Also, don't forget to do the road wheels as well. On the T-34 I've added some wear in front of the driver's hatch (damaged from getting in and out). 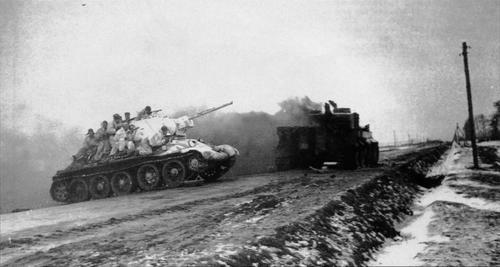 I've also added more damage to the whitewash on the rear than I would other nation's tanks due to the ubiquitous presence of tank escorts. I should mention that I tried this with Middlestone once and the result looked poor because it was too light of a color and too close to white in tone. So I'm not sure what color to recommend for German tanks, other than Early or Mid war panzer grey. 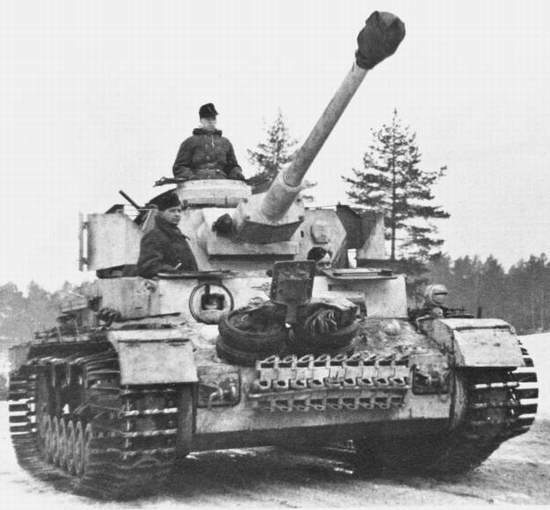 For my later German tanks, I prefer the other method I'll explain now. 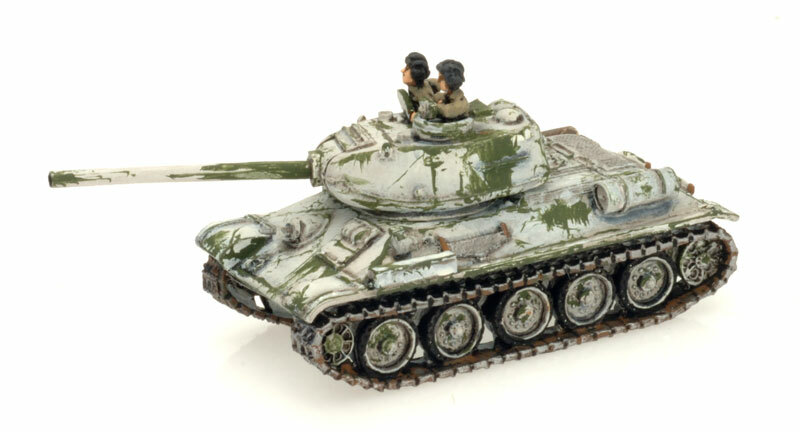 If you have painted up a camouflaged tank, such as these King Tigers below, you can apply the essential steps described above, but instead you'll be using white paint. Limit your whitewash to the areas where it wouldn't have been rubbed off, such as around rivets, between armor plates, and in the cracks and crannies. You may even want to water down your white paint to make a sort of wash (white wash, get it?). DONE! That's all there is to it. I mean, there is a lot more to it, but that's mostly getting the tank to the detailing part. Its a lot of fun and once you get into it, it'll go quickly. It is also quite a rewarding look. I think I'll have to get some Soviet games in soon to figure out what to paint next. I don't know why, but I'm thinking ZIS trucks or GPA amphibious jeeps.... weird. 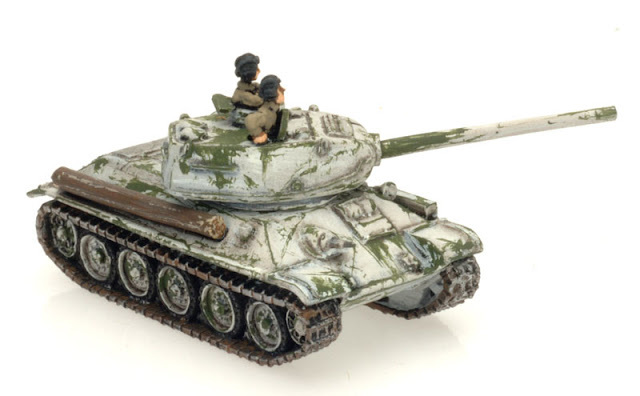 So here's the remaining four tanks in the T-34/85 platoon. Embarrassingly, I've neglected to paint the inside of the road wheels under the tank, so I'll have to fix that! Damn it i wasn't planning on doing my Finnish Tanks in white wash but now I might have to. You make it look achievable. Excellent tutorial Mike; some great ideas here with superb results. Very helpful and well done. 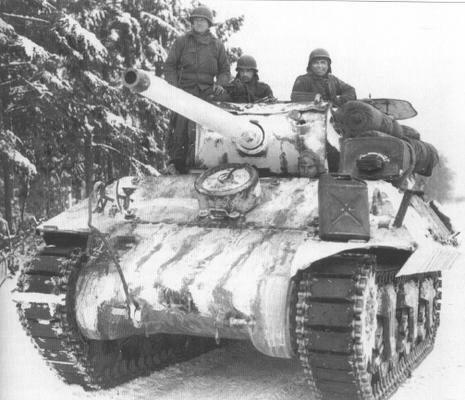 those are awesome... now I want a winter tank list. They look good,thanks for sharing the idea. Cheers! I should really do some more tanks, but I'm feelin' like I need to be in the Sahara for my next project!